A while back, Milana, Susie and I went to Camden to check out the market and just have fun for the day. While browsing the market, we came across this t-shirt stall, and literally, all 3 of us stopped in our tracks and were mesmorised. They were white, slouchy tees, with amazing prints on them. We walked into the stall, only to be met with a gorgeous girl modelling the tees (Hi Cheryl, if you're reading), and we knew we had to buy one each! We were told that it's a small, family fun business, where each of the tee's are handmade, and where they design their own prints. We had so much fun browsing all the different prints and t-shirt styles, as well as chatting to Cheryl about fashion. I ended up choosing this slouchy tee, with a peace sign on it. I paired it with Hollister ripped jeans and Vans sneakers. Yup, so we know that I have a tad obsession with slouchy t's, and this is definitely a nice one to have. It's really soft and really comfortable. Each tee was £15, so defintiely affordable as well. Please tell me that I'm not the only one ridiculously obsessed with slouchy tops! I think it's becoming an unhealthy obsession now! P.S. I'm still on holiday, most likely with very little internet connection. Love it! Hope you're enjoying your holiday! I love the cut, it looks like it fit so well. I can see why you all wanted one! 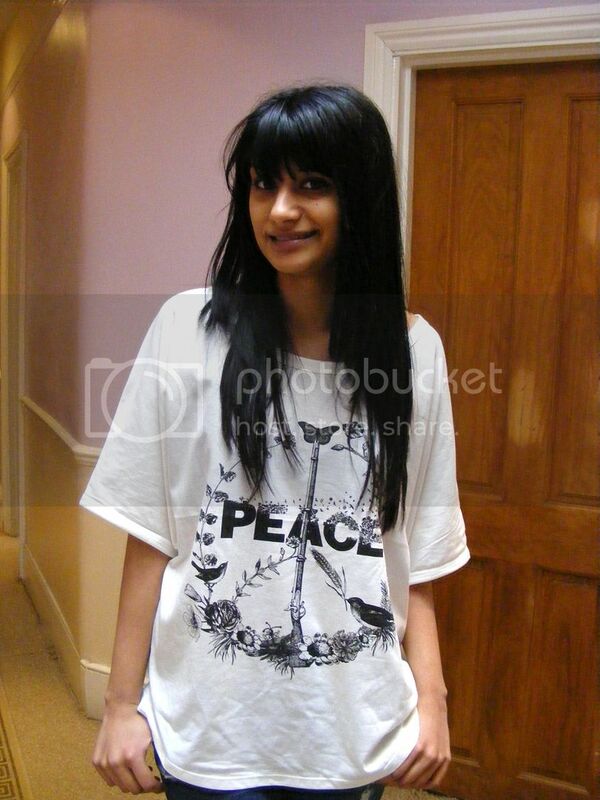 Love your peace tee and WOW your hair. It is stunning! Do I want or want to go to Camden? You look just the right touch glam-relaxed which I am after at this moment. The purple sneakers... lovely... see about that color 'chez moi'. It's the perfect T-shirt! I love it! is so cool and comfy! and your hair!!! you look very nice! Enjoy your holidays!!! it's gorgeous, looks so soft! hope you're having a fab holiday! I'm with you on slouchy tees. I wear them outside and to lounge around the house too. Love the cool peace sign on this one. I love slouchy tops too girl! so comfy and pretty! love the hair by the way! As i type this I'm in a cream colored, plain wing armed slouchy tee from H&M. It's far from my only slouchy tee haha. So i share your obsession. and you look fabulous and comfy to boot, and love the hair too! Slouchy tees are my favs! I love when a shirt is loose and comfy yet stylish! Love this one! Wish we had that brand around here! 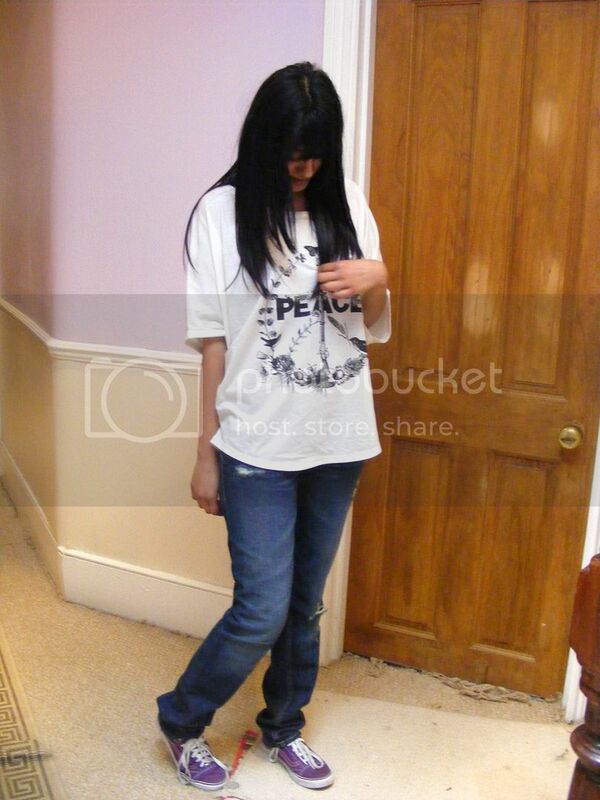 You look gorgeous too Sherin in just a slouchy tee and jeans! You hair looks stunning here too!